This triumphant picture book recasts a charged phrase as part of a black girl's everyday life--hands up for a hug, hands up in class, hands up for a high five--before culminating in a moment of resistance at a protest march. Breanna J. McDaniel is an author and children's literature scholar. She holds an MA in children's literature from Simmons College and is currently pursuing her Ph.D. at Cambridge University, where her research focuses on representations of black children in contemporary picture books. She is originally from Atlanta and currently lives in the United Kingdom. This is her first book. Shane W. Evans is the author and illustrator of more than thirty books for children, including Chocolate Me!, We March, and Underground: Finding the Light to Freedom, which received the Coretta Scott King Illustration Award. He lives in Kansas City, Missouri, where he runs Dream Studio, a community art space. 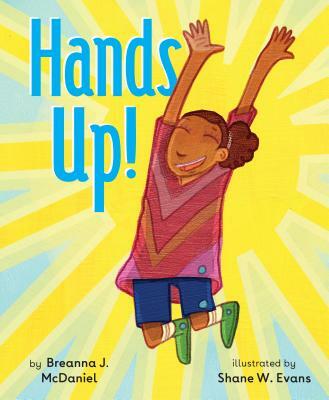 "This book turns the phrase [hands up] on its head to give little ones confidence and pride, culminating in activism." "In dynamic multi-media art, family, friends, and community fill one African-American girl's life with love. . . . Hands Up! can singularly or simultaneous serve as a kid-friendly preview of growing up, as catalyst for a conversation about the dangers of being black in America, and/or as determined reclamation of a loaded phrase." * "Sobering and celebratory both, writer and artist triumphantly assure all audiences, especially young black readers, 'You matter.'"